We are thrilled to be able to feature a fantastic kid’s bedroom creation from Carmel, founder and author of Our Fifth House. Carmel had three problems to solve regarding the bed in her son’s room and time was tight as she wanted everything to be completed by his eighth birthday. Follow her process as she creates a fantastic bed and headboard perfect for an 8-year-old boy. 1. How could she make the queen size bed (they already had) fit in his somewhat small room and still have room for some kind of bookcase/storage for all of his junk stuff? This problem was solved by creating/building a queen sized storage day bed and pushing his bed up against the wall. This was a great solution as far as space and storage was concerned, but this led to issue number 2. 2. What could she use for a headboard? 3. Since they have no space for nightstands, how can she bring in some reading lamps? 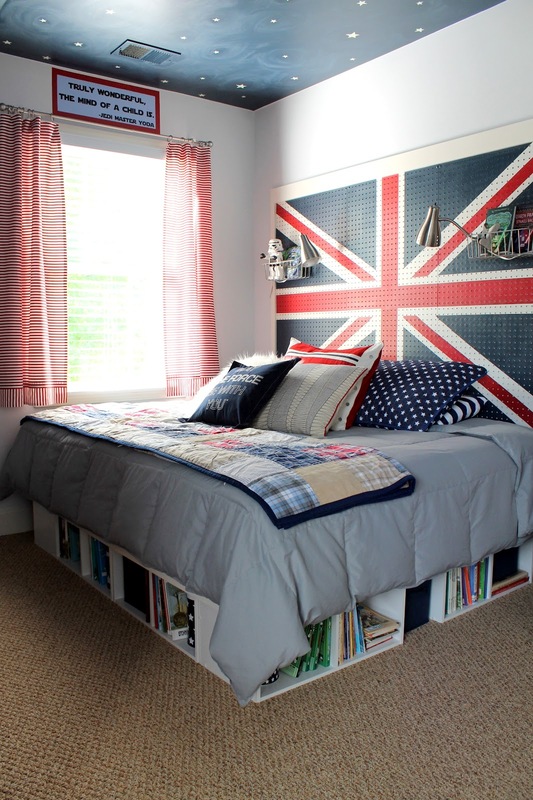 The room has a Star Wars thing going on (as requested by her son), but Carmel thought it needed a little Union Jack action. She used pegboard (Lowe’s) to create a headboard, so that she could use these baskets (Home Depot) to hold books as well as these nifty clip-on lamps (Lowe’s). The baskets were black, but Carmel painted them with stainless steel spray paint. She roughed them up a little with some sandpaper to make them look like old metal baskets. They work as a great alternative to night stands holding just what you need to have bedside – like a storm trooper alarm clock. 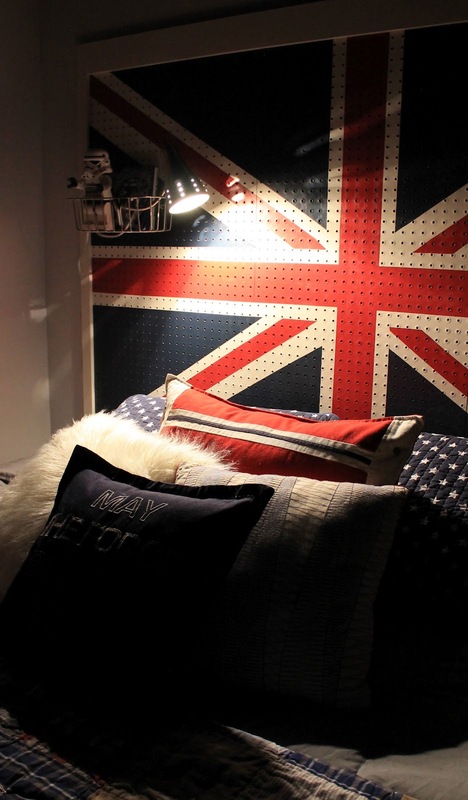 Project Costs (pegboard headboard only): The pegboard comes in many different sizes and it can be painted. She bought three boards for about $35 and some pre-primed wood trim to frame it out for around $15. She already had the paint, so this headboard cost around $50. Apart from being nice and easy on the pocketbook, it resolved problems 2 and 3 above, and it only took about 10 relatively simple steps to get from point A to point Z! If you’ve ever used pegboard for its intended purpose then you already know that you’ll want to leave a little space between the screw and the anchor. Basically, you don’t want them totally flush with the wall because you want to have space to use the peg hooks/ baskets. For all of you that don’t use power saws (yet), you can do a lot with a hand saw! A straight cut is very easy to make. Pre-primed wood, especially for smaller projects, is a great idea. It costs a little more but Carmel thinks it’s worth the time savings. 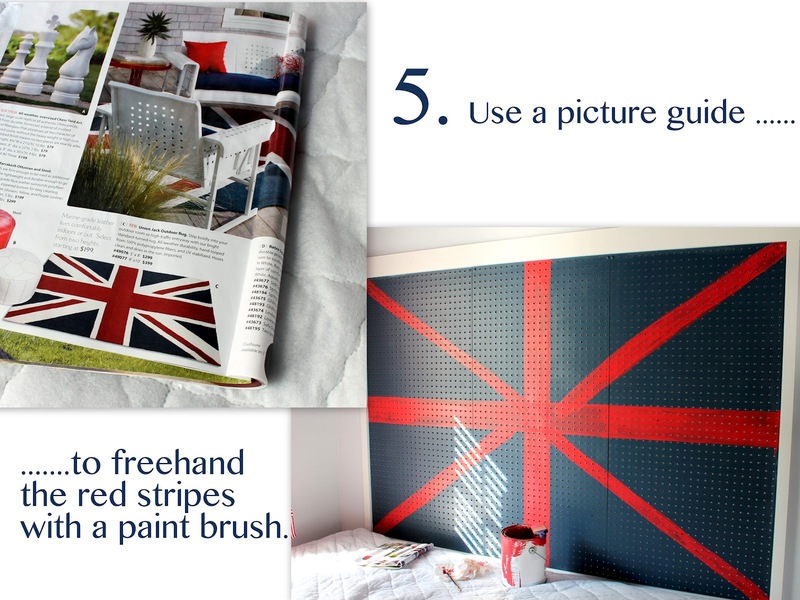 Carmel used this Grandin Road catalog as a guide for painting the Union Jack. You don’t want to overload your paint brush when you’re painting pegboard. The brush needs to stay pretty dry, so you don’t get globs of paint in the tiny holes. Do not stress or be overly concerned with perfection. Use the holes in the pegboard as a guide for taping your lines. Carmel is a Southern California girl currently living and loving life with “the hubs,” 2 kids and 2 dogs in the heart of the bluegrass. She’d love you to follow along at Ourfifthhouse.com and facebook.com/OurFifthHouse as she uses her no-fear-no-rules design attitude to transform her house into a home!